I’m not a big breakfast eater, as I may have mentioned in previous posts. I don’t know, when I get up during the week, I prefer to hit snooze 15 times (literally too, my boyfriend gets irritated by this) than get up, make a healthy breakfast and then get ready. In my head I think “hrrmm sleep in an extra 15 minutes or make breakfast??”. Sleep wins every time. I know I should eat breakfast. On those odd occasions that I do, I usually feel better. To try and overcome this I have bought cereal, taken it into work and ate it at my desk. Seeing I can’t really do this anymore, I have found another solution. A couple of weeks ago my wonderful friend Anj made breakfast for me for my birthday. Well, when I got to her house it turns out her mum had cooked, and put on a feast! 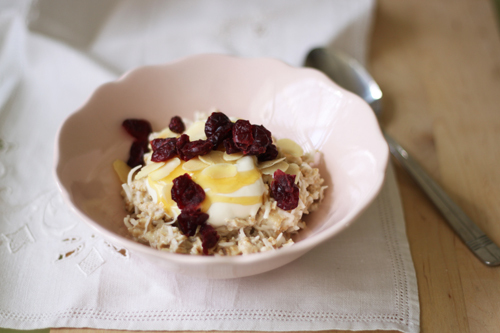 We started with this oat dish that after one mouthful I knew this was my new breakfast. It was so yummy and slightly sweet, only from honey and almond milk, and healthy that it was ideal! Lorraine, Anj’s mum had put this little beauty up on her blog, so after getting a hold of the recipe I made it one night, left it in the fridge overnight, and since then have been eating it every morning. You can mix it up, add different nuts and dried fruit. 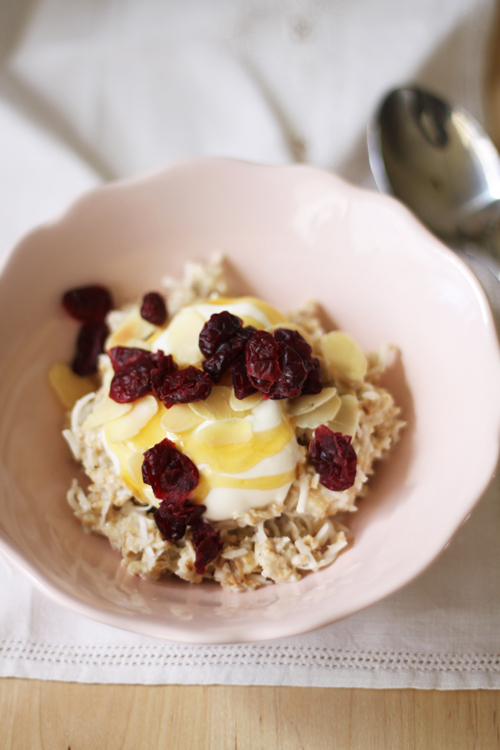 You could add some flaxseeds to the mix to make it super healthy! Actually, I’m going to add that to my next batch. It lasts the week in the fridge, and makes around 8 – 10 servings. You don’t need a big serving cos this guy fills you up quickly! In a large container with a lid, add the oats, coconut, almond milk, honey, vanilla, nutmeg and cinnamon. Give it a really good stir so all ingredients are well combined. Place the lid on and leave in the fridge overnight. 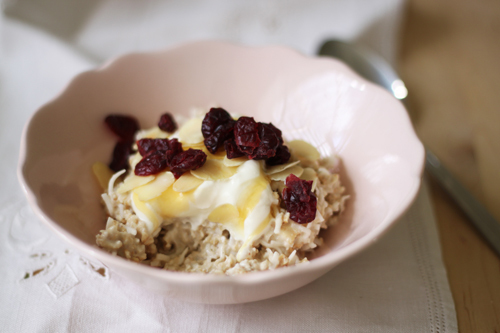 When serving, add about one cup of the muesli to a bowl, and top with your favourite healthy toppings, be it banana, dried fruit, nuts, honey and flaxseeds. Eileen - I love dried apricots, so needing to add these next time! This sounds so good! 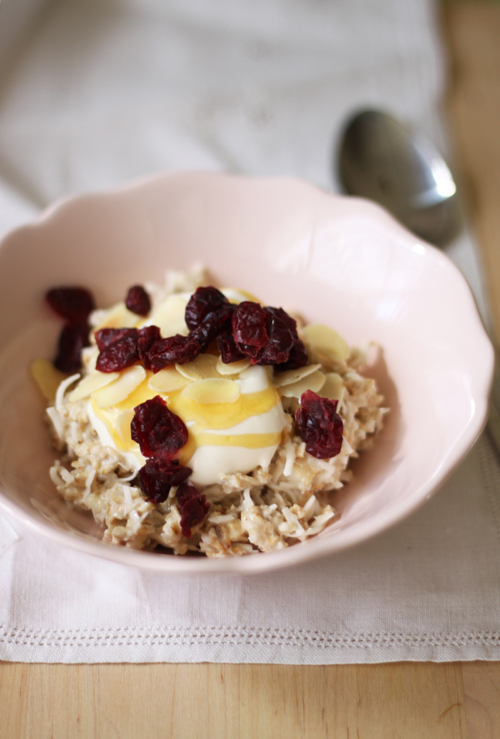 I wonder if you could substitute oats for quinoa to make it paleo? I would love to know what you think!